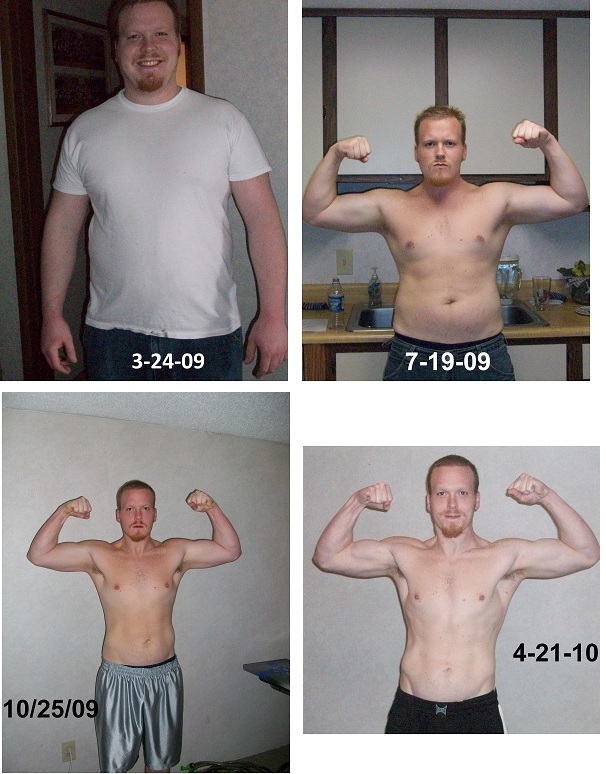 Back in 2009, I lost 90lbs and dedicated my life toward health, fitness, and self-improvement. Up until that point, I never had a consistent exercise regimen, often abusing my body with food and alcohol. Despite my long battle with obesity and poor lifestyle habits, today I’m the healthiest I’ve ever been. I eat a well-balanced diet, exercise in some form every single day, and try to be an example of “the healthy guy” for those around me. But it wasn’t always this way. Growing up, I was always a picky eater. Dinner was usually a disappointment unless it involved a McDonald’s happy meal, pepperoni pizza, or some other type of fast food. I would frequently pass on normal, delicious, healthy foods in favor of junk foods and dessert. I specifically remember a night as a kid when I refused to eat my dinner and wanted to skip straight to dessert. When my dad refused, I secretly scraped my boring meal into the trash when he wasn’t looking, then proudly told him that I was done with my food and ready for ice cream. This didn’t go over very well with dad, but he eventually let me have the ice cream. When it came to eating, I was given the freedom to make my own choices growing up. Mom passed away when I was five years old, so Dad was faced with raising three boys all on his own, and he did the best he could. He frequently prepared meals at home, but I either fussed or flat out refused to eat unless it was some type of junk food paired with a sugary soda. Even my school lunches were usually some kind of white bread sandwich paired with a bag of Doritos, Mountain Dew, and hostess pie for dessert. Most of the time, Dad would cater to my meal requests, whether it be pizza, fast food, pancakes, or just a grilled cheese and chicken noodle soup, and I loved him for it. 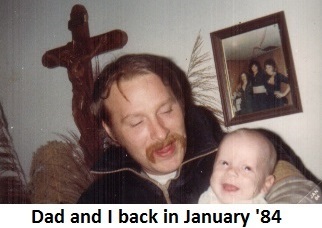 He’s actually a fantastic cook and, looking back, I wish I hadn’t been such a fussy kid! Nowadays, healthy eating is a passion that both of us share, but he still cooks his amazing pizza and seafood on special occasions. Poor diet and lifestyle choices followed me into my teenage years. 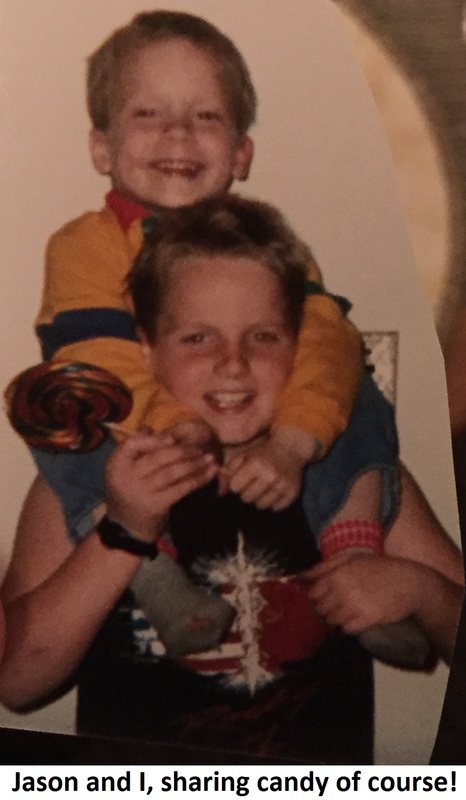 In early 1997, when I was 13, my 18-year-old brother Jason was tragically killed. One of the greatest idols in my life had been suddenly torn away from me forever, and whether or not I realized it at the time, I was lost without him. He was one of my best friends, and his absence was one of the most difficult things I’ve ever dealt with. Thankfully, a great support system helped me get through that heartbreak, but the depression from that event didn’t help my lifestyle habits. 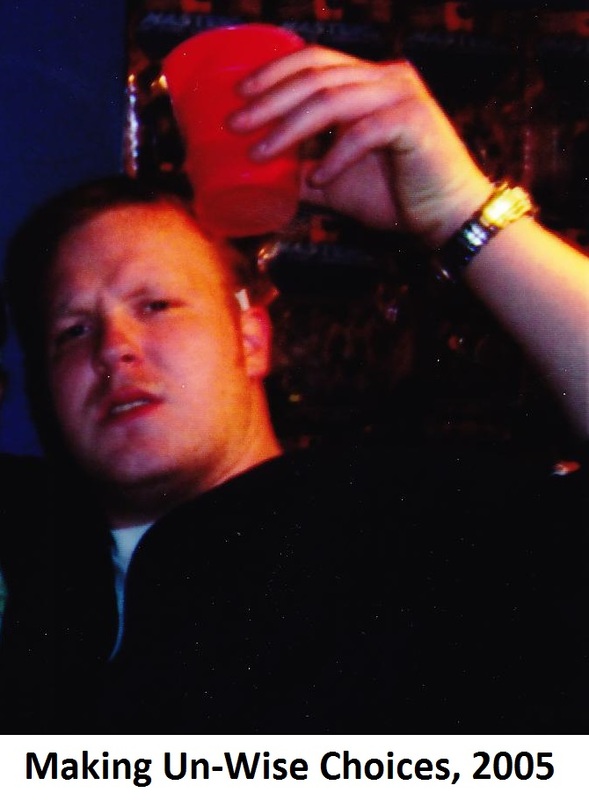 At age sixteen, I started smoking cigarettes in an effort to fit in and “be cool” with my group of peers. My meals at school consisted primarily of fast food sandwiches, cheese sticks, pizza, and other junk foods. I drank at least 12oz of soda with every meal. Each morning, I would wake up miserably tired and drained. My exhaustion was so severe that I would sleep through classes, and it’s a wonder to me that I maintained good grades through most of my early education. I wonder now how much more I could’ve accomplished if I had been eating a proper, healthy diet, and getting adequate rest. After graduating high school, my lifestyle habits got even worse. It was rare that a day went by when I didn’t have some sort of fast food or processed food. 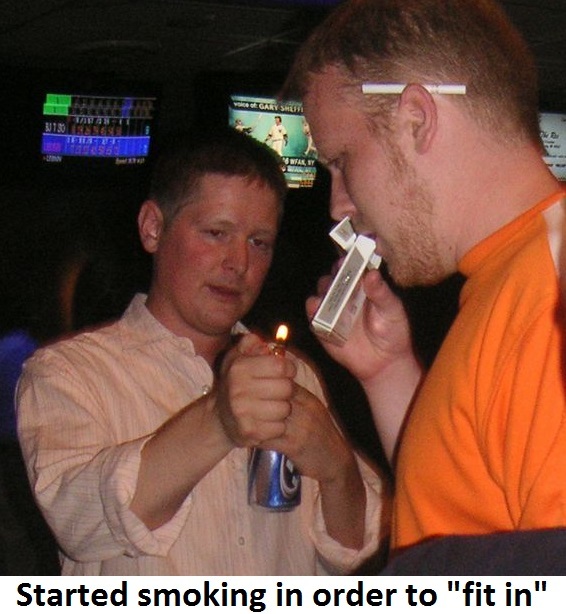 I consumed alcohol too often, and smoked close to a pack of cigarettes per day. I supplemented these poor lifestyle habits through occasional exercise, but not with any sort of consistency or commitment. I spent a couple semesters in college, changed majors three different times, and eventually stopped going altogether. 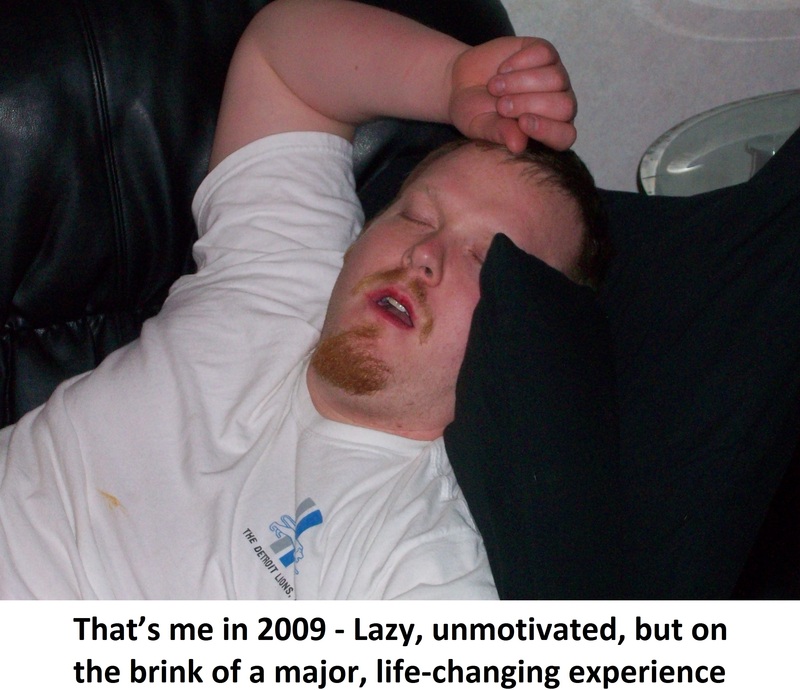 I worked a few different jobs, mostly in food service, which fueled my poor eating even further. In 2004, after getting fired from Big Boy of all places, I began working in the shipping department of the auto manufacturer my Dad worked at for almost 30 years. My poor lifestyle choices continued, but at least I was holding a job. After two years of working at my Dad’s factory, I hit a significant milestone. 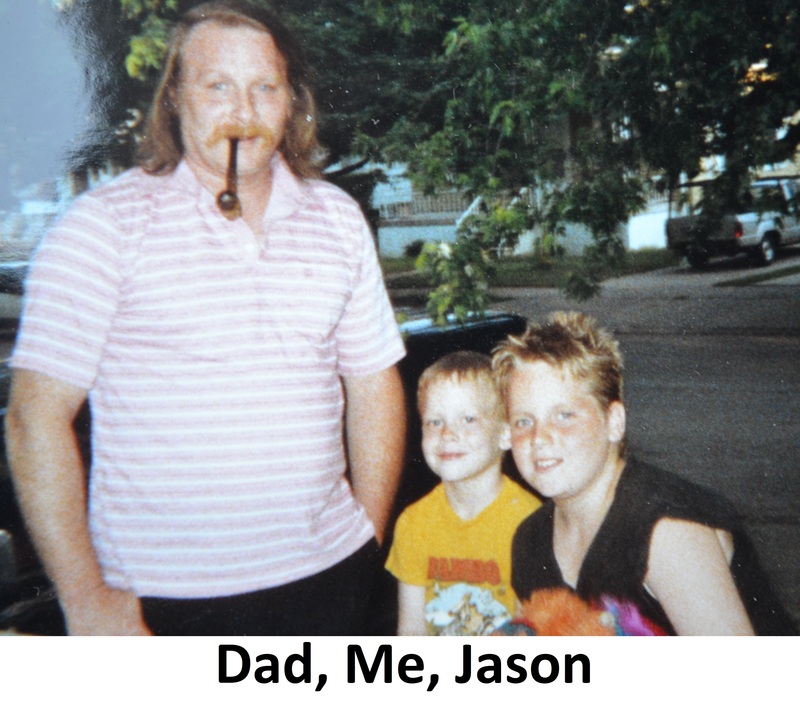 On May 2, 2007, the day that would’ve been my late brother Jason’s 29th birthday, and a full decade since his death, I decided to make a major change and quit smoking. I had finally decided that giving up cigarettes was just something I had to do for myself; that it was within my power to overcome it. It was hard, and it took me two tries, but I did it. After 7 years of smoking cigarettes, I had finally quit cold turkey at the age of 23. To this day, I’m so thankful that I made this choice, because that marked the beginning of a complete lifestyle change for myself. However, I didn’t exactly find success immediately. Fitting the stereotype, I gained weight excessively after I quit smoking. I was done with cigarettes but replaced my craving for nicotine with more food and alcohol, so my calorie intake increased dramatically. I was living away from home for the first time and making consistently poor lifestyle choices. My girlfriend and I were both overweight and eating whatever we wanted, whenever we wanted. Our dinners usually consisted of take out, fast food, and fried food. When we did eat a “normal” meal, it was often something frozen, boxed, or processed. Eventually, Julie decided that she had had enough with being overweight and chose to undergo lap band surgery. I encouraged her to try to lose the weight on her own, but eventually supported her decision to go through with the surgery. Unfortunately, it was a decision I would regret later on. In March 2009, my weight had reached an all-time high. 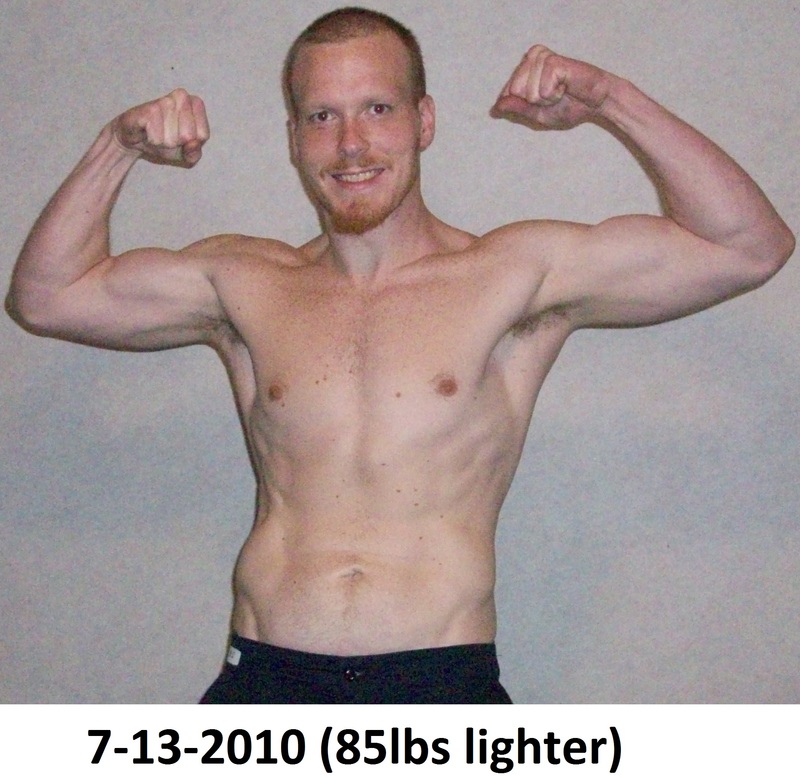 I was 6ft, 272lbs, and on a one-way path toward lifestyle-related disease. I rarely exercised, and my daily routine revolved around the next junk food meal I would consume. It was at this time that I decided to make my second biggest lifestyle change; I was going to lose weight. It was time to change the course of my life. I can’t say there was a specific light bulb moment that made me realize it. I just looked at my lifestyle, realized that it was within my power to overcome my addictions, and made the choice to do it. It was that simple. You can talk about losing weight or getting healthy all you want, however, at the end of the day it comes down to discipline. Improving well-being is a choice, and it takes willpower, plain and simple. You have to make the commitment, and once you do, it’s inspiring. And it’s addicting. And believe it or not, once you start, it gets easier as you go along. At least it did for me. So, with a renewed sense of passion, I got to work, and began tracking all of my meals. I didn’t follow Atkins, Paleo, Keto, or any other “fad” diet. Instead, I educated myself and found inspiration from many different sources. Initially, it was the intense-workout.com. This site introduced me to the types of foods I needed to be eating and avoiding. It also gave me a starting point for exercises and workout routines to implement. This was a terrific start for my new approach to diet and exercise, so I owe a debt of gratitude for this website, which still exists today. My diet strategy from day one was very simple: count calories. I didn’t focus on the quality of foods as long as I kept my calorie count down. My diet was still very poor; I just ate less overall. My lunches at work consisted of frozen diet meals and other processed “healthy” foods, like Lean Cuisine and Healthy Choice entrees. I still allowed myself to drink alcohol multiple times per a week, and weekends were reserved for cheat meals galore. I allowed myself to do pretty much whatever, whenever, as long as I logged every single calorie, and restricted total calorie intake on several days of the week. 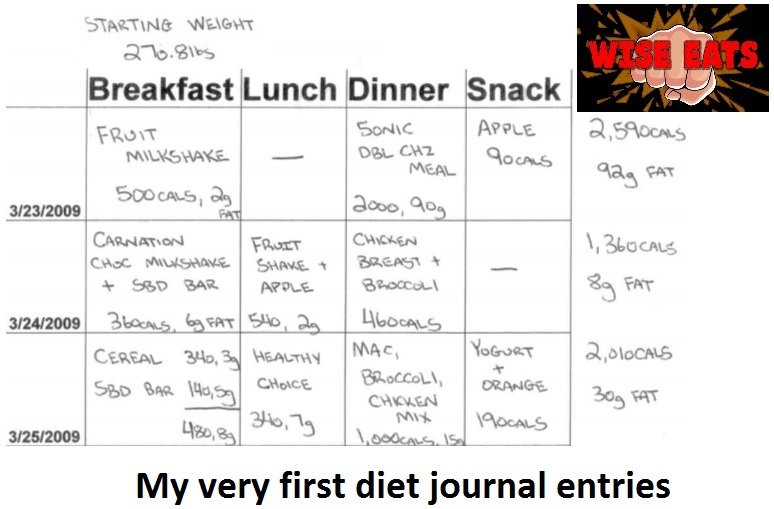 The greatest habit I developed during this time was starting a diet journal. No matter what I ate, good or bad, I wrote it down, and estimated the number of calories I consumed. Regardless of food quality, my goal was to keep the calorie count down. In order to supplement my calorie deficit, I also began jogging and occasional weight lifting. The weight loss was immediate. Every week, I would track and record my weight. Living in a calorie deficit, I lost weight nearly every week. If I didn’t lose anything one week, I would usually lose even more the next week. When it came to eating, I had good days and I had bad days. My diet was far from perfect. Weekdays were reserved for lower calories, and weekends were reserved for cheating, a lot. Looking back, it’s amazing the foods I was able to consume and still lose weight through calorie restriction. But in my mind, if I averaged a low per-day calorie amount for the week, I was doing well. And for weight loss, it worked! No matter how many people want to contest it, actual weight loss is simple math; calories in, calories out. Calorie restriction won’t help you build lean muscle, and it’s not the most sustainable way to keep weight off permanently, but it does work for weight loss. The problem is, many people don’t develop sustainable habits like getting stronger and making exercise a regular priority in their life. They fall off and go back to their old inactive habits. Luckily for me, I stuck with it, because I was determined to lose weight and kept it my singular focus. The next major step toward improving my health was limiting soda and fast food. If you’re reading this and still drinking soda, I encourage you to do whatever you can right now to stop permanently or at least cut back! It was one of the hardest things I’ve done, but over many years, I gradually phased soda out of my diet, and it was a game changer! Its dramatic effects on blood sugar drastically impact your mood, performance, energy levels, and cognitive function. Even diet soda is filled with poison that alters your brain and body chemistry. It literally does nothing for your body other than hold you back from being the optimized human you were meant to be. Today, I won’t even touch the stuff, nor do I desire to. Drinking that toxic junk is not even an option in my mind. But it took many years to get my mind to that place. Same goes for fast food. During my weight loss, I limited fast food “cheat” meals to weekends only. Today, I rarely eat any type of junk food at all, because I enjoy the taste of real food and the feeling of feeling good! Eventually, I transformed my diet and workout regimen completely. 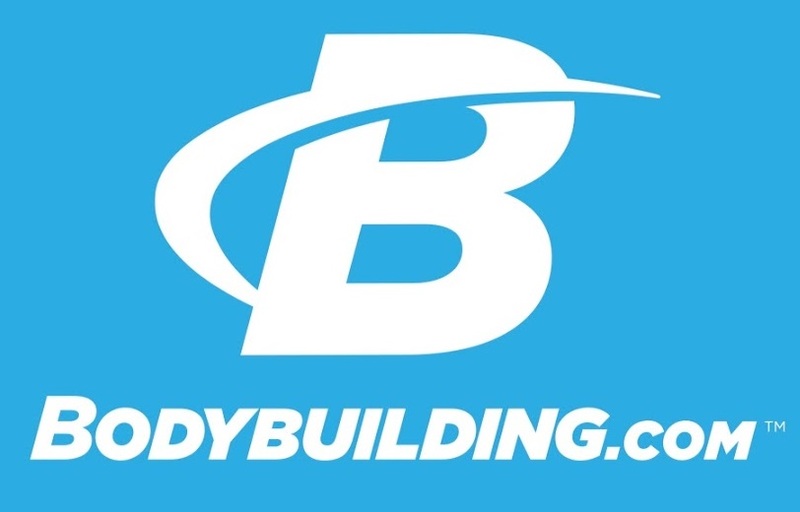 As my weight loss progressed, I gained more knowledge on diet and exercise through websites like bodybuilding.com. I started a consistent weight training regimen and spent more time in the kitchen. I replaced frozen diet meals and heavily processed foods with home-prepared meals. I drank mostly water and started focusing on whole sources of nutrients like nuts, fish, chicken, whole grains, vegetables, and fresh fruits. I got smarter about my meals away from home. Initially, I would prepare large batches of whole wheat pasta or brown rice paired with chicken breast, spices, and fresh or frozen vegetables. I would pack containers to have convenient, healthy meals at work. I made smoothies with fresh and frozen fruit and whole grain oats. To this day, I still prepare nearly 100% of my meals at home, although my grocery list has evolved significantly. Instead of pasta I will use jasmine rice, quinoa, or green vegetables. 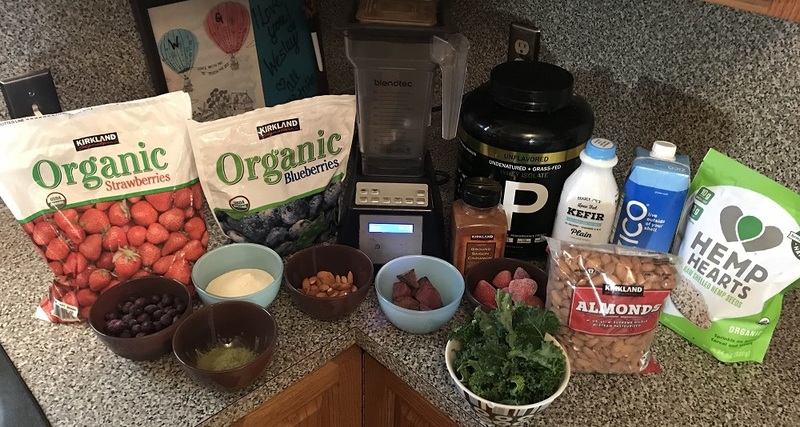 Instead of fruit smoothies, I generally make green smoothies packed with fresh vegetables, fruits, and other superfoods. But getting in the kitchen initially was a great place to start, and a huge shift toward health improvement. On August 16, 2010, 17 months after I started my diet journal, I had lost 87.4lbs. I was smoke-free, on my way to being soda free, and finally feeling great about my body, which was something I had never felt in my life. I had accomplished a major feat and was changing my life. But this was only the beginning. Losing the weight was only the first part of the battle. I had accomplished my goal of losing weight, but now what was I going to do? I was still making poor food choices too frequently. During Christmas of 2010, only 4 months after I had lost 90lbs, I experienced one of the worst flus I’ve ever had in my life. After recovering, I followed up this sickness with an epic week-long junk food binge (the diet journal entries don’t lie!). 3 months later, on March 13, 2011, I got so ill that I temporarily lost vision and experienced some brief body paralysis. As I crawled around my house alone with what tiny bit of energy I still had, I remember being scared that I wouldn’t remain conscious long enough to make it to the phone in order to dial 9-1-1. I was 90lbs lighter, and the healthiest I’d been my whole life, yet I was so sick that I thought I might die. Thankfully, I recovered after a few days of bed rest. 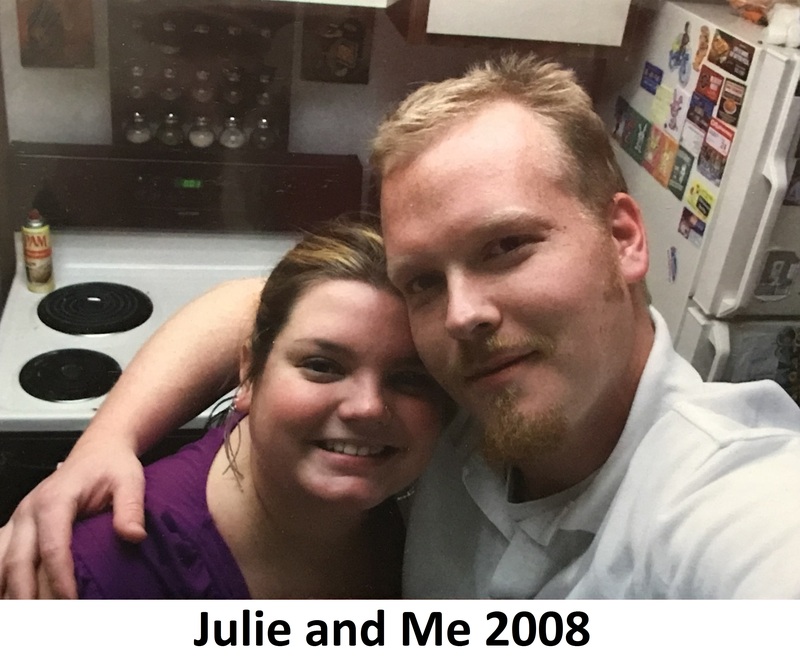 One month later, in April 2011, my girlfriend Julie of six years tragically passed away after suffering complications from multiple weight loss surgeries. It was another shocking, difficult period of my life. 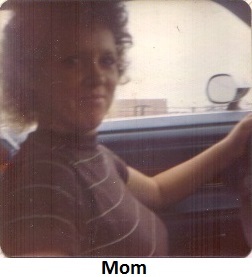 I was no stranger to suffering loss, having already experienced the deaths of my older brother and mother. But Julie’s passing was a major wake-up call. In a way, I believed I had failed her. That if I had gotten my health on track sooner, I could’ve helped her, instead of just enabling her lifestyle choices and standing by during her weight loss surgeries. If I had been smarter, maybe I could’ve inspired her to overcome her addictions the way I did. Whether it was conscious or not, looking back, I think her death inspired me to keep going. I couldn’t let her loss be in vain, and it confirmed that I needed to stay the path that I was on. I hadn’t helped her, but I could still help myself and others. I knew that I had to continue my journey of health improvement and that there was no turning back. 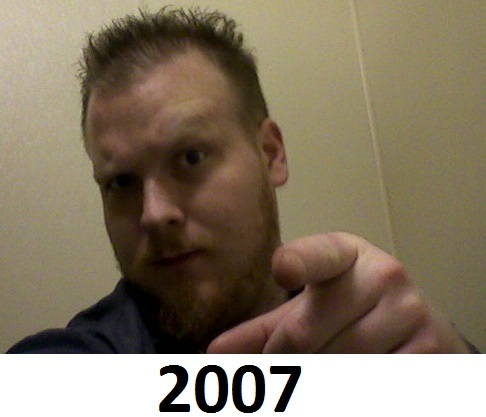 Since my initial weight loss in 2010, I’ve kept the 90lbs off and completely altered my lifestyle. My path since then has been a learning experience that I look forward to sharing with everyone. As I continued to eat better, sleep smarter, and exercise more efficiently, I became productive in ways I never thought possible. At 30 years old, I went back to college, earned my Bachelor’s degree in business, and was finally performing optimally in all areas of my life. I got promoted at work, purchased a home, and in 2016, married my beautiful wife Giovannina. At 34 years old, I’m in the best shape I’ve ever been in, and getting stronger every day. I haven’t been sick in years, and continuously work to improve my lifestyle habits. I’m focused, motivated, and determined to help others who face the same struggles I did, and inspire those who share a similar passion. Made the commitment to change my lifestyle, quit smoking, and lose weight. Made it a goal for myself, shared it with family and friends, and found motivation by making it my sole focus. I recommend that you set a fitness goal for yourself. Do you need to lose weight, build muscle, or both? What is it that you want to achieve specifically? Found a message that inspired me. Gained knowledge on weight loss, proper diet, and exercising. 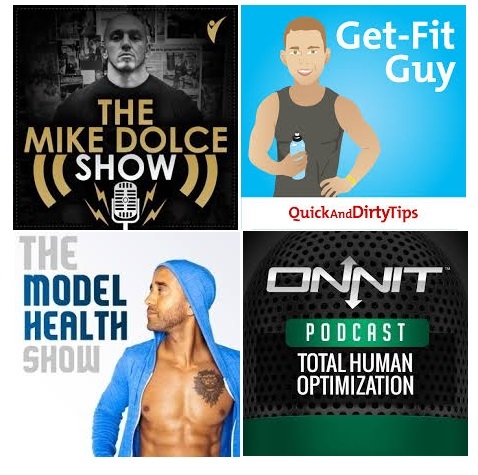 Websites like the intense-workout.com, bodybuilding.com, and podcasts like The Model Health Show, the Mike Dolce Show, Onnit, Get Fit Guy, and many others really inspired me to get where I am today. There are a million resources out there you can turn to, you just have to find one that resonates with you and that you trust. Determined my daily caloric needs. Created a goal calorie count for the day and average calorie count for the week. Once you know the number of calories required to maintain weight, you can adjust them up or down to either build muscle or lose fat. In my case, I operated under a calorie deficit in order to drop the extra pounds. I also purchased a digital body fat monitor. It doesn’t give a precise measurement of body fat, but it will give a good estimate and allow you to track changes over time to see if you’re trending in the right direction. Today, I still track my weight and body fat weekly. Started a diet journal and began calorie counting every meal. Wrote down every meal and kept track of my calorie total for each day and daily average for the week. Also purchased a kitchen scale to help guesstimate calorie count of my home prepped meals. This is a terrific strategy that helped me lose weight initially, and although I keep a diet journal to this day, calorie counting is no longer a significant part of my daily life. Calorie restriction will work for weight loss, because it worked great for me to lose 90lbs, but at some point, you have to look at quality of foods and source of your calories if you want to get stronger, fight sickness, and boost energy. Shifted my mindset. Eventually, my focus turned from calorie counting to food quality, then from losing weight to getting stronger. The truth is, maintaining a healthy weight is important, but it’s only one piece of the getting healthy puzzle. Once you start focusing on strengthening your body instead of dropping calories and losing weight, it entirely changes your outlook. I started reading nutrition fact labels and ate only real foods with ingredients that I understood. Instead of focusing on calories, fat, protein, and other macros, I started paying attention to ingredient lists, because those provide your first glimpse of the quality of that food. If it contains an ingredient you don’t recognize or is hard to pronounce, chances are it is not a wise choice. Google those ingredients and aim to buy only fresh food and other products from whole sources. Eliminated soda and fast food from my diet. If I can do it, YOU can do it! I drank soda with every meal my whole life and ate fast food or take out nearly every day. Phasing them out took time and dedication, but it’s a must for your health. Over time, I limited fast food to 1-2 meals per week until I was able to quit it completely. Even still, during and after my weight loss, I would over indulge on my fast food cheat meals. Instead of having a cheat meal, I’d have a full cheat day, or weekend, or even a full cheat week. Today, I rarely have them at all, and my cheat meals consist of more home cooked meals or a nice dinner out with my wife. But, when I do “cheat”, I do so mindfully. If you’re in a similar situation, try not to live an all or nothing lifestyle like I did. Enjoy yourself, but do so in moderation, and always with your goals in mind. After you treat yourself, get right back to making wise choices on the very next meal. You don’t have to eat perfect all of the time to lose weight and get in shape. Aim to be perfect 100% of the time, and if you come in at 80 or 90% that’s fine. Just try to get 1% percent better all the time. Started preparing meals at home. Go grocery shopping. Lots of fruits, vegetables, lean protein, healthy fats, healthy carbs. If you don’t mind leftovers, prepare large batches of food to have for future meals, and to share with family or friends. For lunches and dinners, I’ll usually make some variation of the chicken wise rice or chokeslam chicken salad. 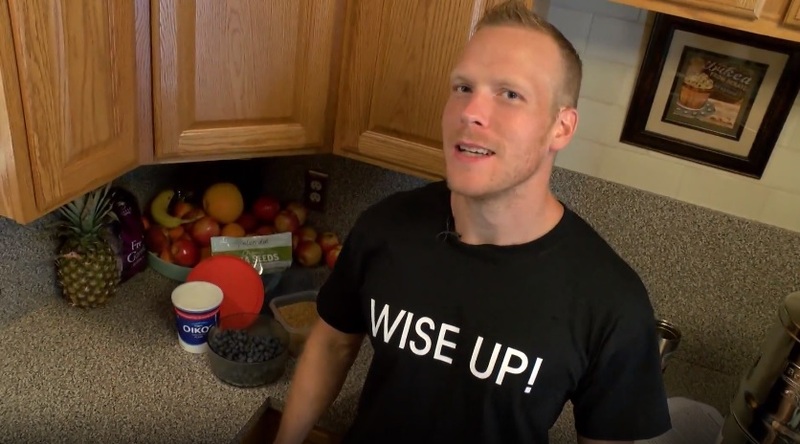 For breakfast, I’ll make large batches of the Wise Eats Energy Bowl, or the razor’s edge scramble, or a sidewalk slam smoothie. I always mix and match ingredients and try new ways of preparing things to keep it fresh, tasty, and interesting. Found ways to exercise that I enjoyed. At first it was running mixed in with some weight lifting at my local gym, then graduated into more at home workout programs like P90X, UFC Fit, and Body Beast. Those involve investing in a little h ome gym equipment, but if you can afford it, home workouts are a terrific and convenient option. And you don’t have to spend a fortune. A few sets of dumbbells are all you need to get a great home workout. Today, I’ll sprinkle in physical movement no matter where I am, but mostly enjoy working out at the home gym I’ve built over the years. There are a million different options. You can workout at home, at work, join a local gym, hire a personal trainer, join a fitness class, or just get outside and move around. My wife and I love going for walks together. Just try different things and see what works for you. The key is to find something that you enjoy that you will do on a consistent basis. For me, I initially found that with the UFC Fit program. It was challenging, fit my personality, and allowed me to do all of my workouts at home, which fit perfectly into my schedule. I always felt amazing and accomplished after those workouts, and hardly ever dreaded doing them. 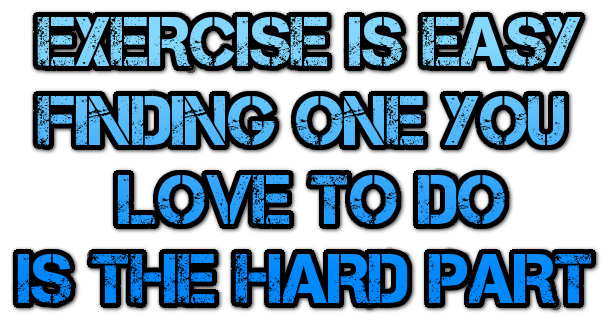 When you find an exercise program that you’re passionate about, working out is never a chore. So, find that thing that you love that you’re going to look forward to doing several times a week. Today, I love walking and lifting heavy weights. When I get tired of that, I love doing HIIT training with UFC Fit or kettlebells or trying an entirely new program. I constantly change up my routine to find variety and keep myself engaged. So, experiment, fuel yourself properly, and eventually you’ll find something you love, and have energy for days to do it! Tracked my progress. Recorded my weight every Monday at the same time in order to maintain consistency, but also kept an eye on where I was multiple days throughout the week, which I believe helped improve mindfulness toward my weight loss goal. When monitoring your weight, don’t be disappointed if your results aren’t immediate or consistent. The scale won’t always accurately reflect your performance. If you don’t lose this week, you will lose next week if you stay consistent. I lost 90lbs over the course of 17 months, which is an average rate of about 1.25lbs per week, and I cheated a lot! Every weekend I was still eating bad food and drinking alcohol, but at least this time I was doing it with the weight loss goal in the back of my mind. And I always got back on track when Monday rolled around. Realize that it’s a marathon, not a sprint, and that if you stay consistent, you will see results, even if you fall of the rails from time to time. Crash diets may offer quick results, but these will be temporary. You want to lose weight at a slow pace, maintain consistency, which will lead to greater chance of permanent success. So that’s my story, and how I lost 90lbs. You may or may not have a significant amount of weight to lose, but you should have some specific goal for your health. If you don’t, think of one right now. Are you satisfied with your physical appearance and the way you feel mentally and physically? If not, what would you like to see happen? Do you want to lose weight? Gain muscle? Be more flexible? Run further or faster? 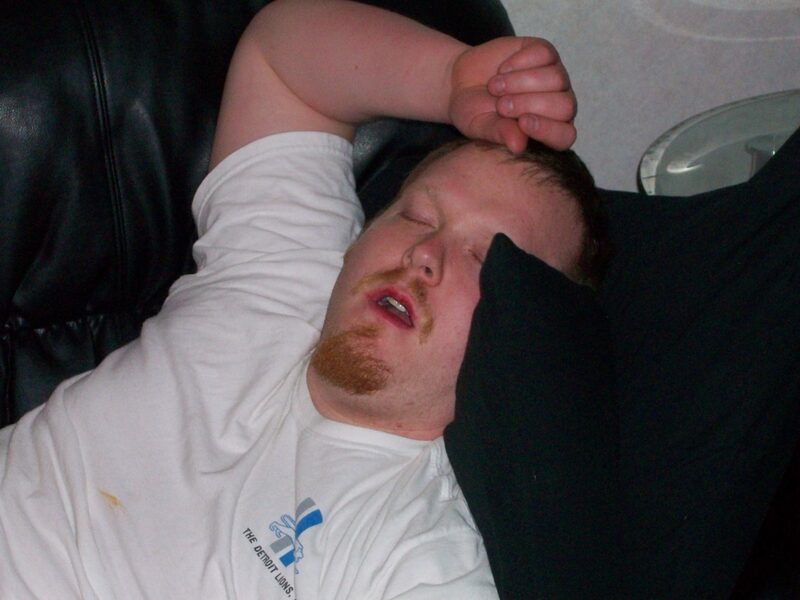 Get better sleep? Be more productive? Feel better? Think about it and be honest with yourself. Figure out what you want and write it down. 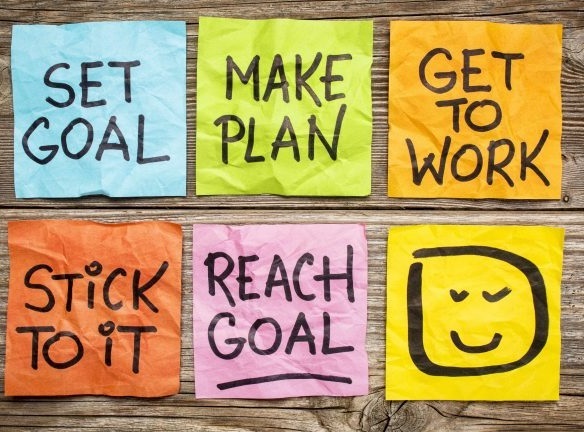 Make a commitment, develop a plan, set goals, and stick to them. Is this what you really want? Is your goal just idea in your mind? If so, it’s time to turn that idea into an action plan. What steps do you need to take to accomplish it? Write them down. Tell your friends and family of your plans. Get them on board. It’s time to make fitness a tangible objective instead of just something you’ll get around to next week or on New Year’s Day. It doesn’t start tomorrow, it starts today. So, figure out what that goal is and get after it. Until you decide to make the change for yourself, it’s not going to happen. Nobody else can do it for you; you have to do it for yourself. 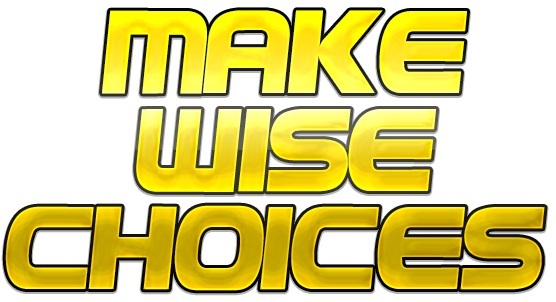 If you’re ready to start making positive changes in your health, sign-up for our free newsletter, Wise Choice Nation. If weight loss is your goal, I hope that something in this story inspires you to take action in your own life. If your goal is not weight loss, but building muscle, achieving some other goal, or overcoming another challenge, we have so much more to come for you. Either way, stay tuned, because this is just the beginning. My dream is to help people achieve their goals and become the best version of themselves that they can be. If you have a question, comment, or story to share, please visit the contact page. Until then, thanks for reading, and remember to make wise choices! I read your story…it is truly inspiring. I believe you will accomplish your goal of helping others. I’ll be praying for you.Iam going to start journaling. 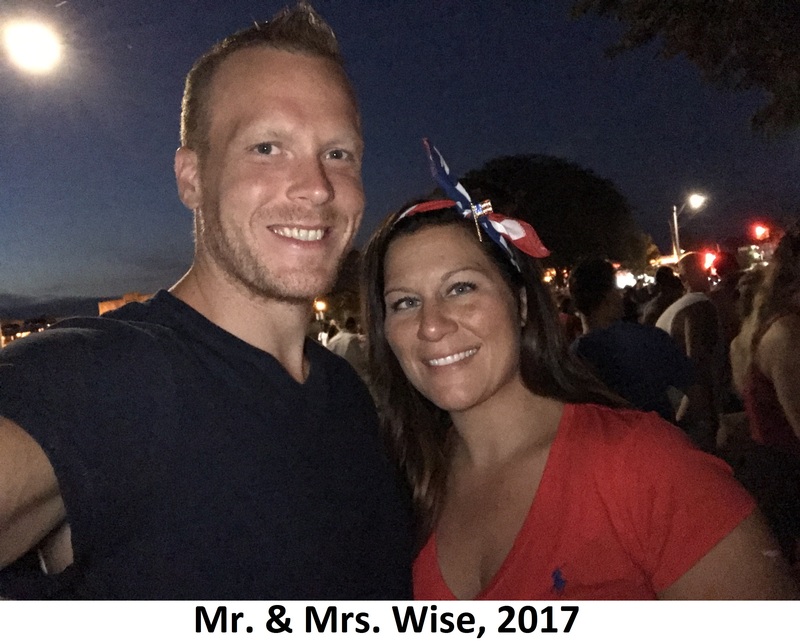 Hoping to make wisers choices for myself and family. Keista Kale Chips – Increase Your Green Vegetable Intake and Optimize Your Health!